If you are looking for information on the Graniterra franchise business opportunity, Graniterra franchises or Graniterra franchising, then you have come to the right place. 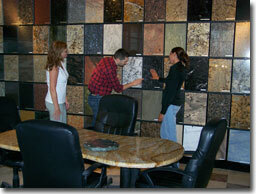 In 1997, our organization was founded as European Tile & Marble. The company and its affiliates have earned a remarkable degree of client loyalty through a keen focus on consistent high quality, efficient project management, and exceptional customer service. 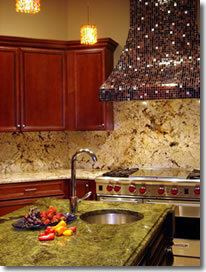 We stock a wide variety of natural stone, including granite, marble, onyx, and travertine. We fabricate the stone, cutting and polishing it into finished forms. And we install the stone, creating beautiful countertops, vanities, and fireplace surrounds. As both pioneers and industry leaders, we have a unique and comprehensive approach to providing attractive solutions to our customers. Now Graniterra, with its time-tested business model, is ready to take the next step-bringing our beautiful stone products to customers around the country. Graniterra is one of the first full-service natural stone franchises in the country. We're looking for people who can build on our successful business model, offering the same quality products and outstanding service to customers in other parts of the country. When you become part of the Graniterra team, you benefit not only from a healthy and growing industry, but from an established concept and a system that provides you with the advantages and tools you need to run an effective business. As a Graniterra franchisee, you have a distinct operational advantage, with your own showroom and inventory, direct employees, control over scheduling through our specialized software, and a steady flow of industry referrals. These are just some of the reasons why the Graniterra business model is so solid. Help getting your business started: Assistance with site selection, design, and construction of your showroom and fabrication/warehouse facility. Assistance with supplies and inventories: Access to established, approved suppliers, plus help with vendor negotiations, initial inventories, and showroom samples. Professional training: Training is held at our headquarters and at your new location, comprehensive training covers technical aspects, sales, custom production, and more. Complete documentation: A detailed, comprehensive operations manual to help with day-to-day processes and procedures. Ongoing Assistance: On-site start-up help and periodic field visits. Marketing guidance: Assistance with the development of initial and ongoing consumer campaigns. Our proprietary software system: A custom package that promotes efficiencies in the workplace; from ordering inventory to customer relations management, including scheduling appointments, providing quotes, scheduling fabrication, printing invoices, and tracking prospects.